I’m so sorry I have skipped a few weeks lately. Things have been crazy around here. We are getting ready to move across the country, from the Boston area to the Seattle area. With two kids under the age of 3. I’m very excited, but, as I said, it’s been a bit crazy. Please forgive me if this are a bit slow in the next few weeks, but I hope to back up to speed for the holidays. I hope. These delightful little nuggets of joy were a fun find from The Texanerian. I changed a few things but that was my inspiration. These are perfect for fall and a wonderful, fairly healthy, way to start Halloween. full of actual pumpkin and lots of meat free sources of protein these guys will fill you up. My older daughter ate them one after another until I had to cut her off! Also a hit with the neighborhood kids, and adults. Yummy! Preheat the oven to 350 °F. Line a mini muffin pan with 24 muffin liners or oil pan. In a large bowl, mix together the coconut flour, almond flour, baking soda, cinnamon, cloves, nutmeg, and salt. In a separate medium bowl, mix together the eggs, coconut oil, maple syrup, pumpkin, and vanilla. Add the wet ingredients to the dry mxture and stir just until combined. Pour the batter evenly into the muffin liners, filling each liner until almost completely full. You’ll likely have enough batter for another six. 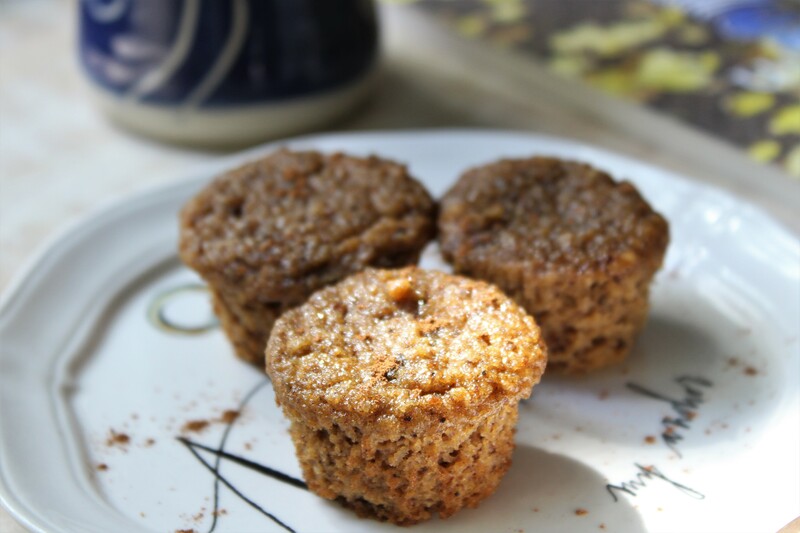 I scooped them into a big muffin pan so I could cook them at the same time and they were flat but perfectly yummy. Bake for 11-13 minutes or until a toothpick inserted in the middle comes out clean. Turn out onto a wire rack to cool completely. These need to rest for at least an hour before serving, both because of taste and texture. Store in an airtight container in the refrigerator. Best in the first 2 days.